If you live in the North Bay, odds are that you've met at least one tourist who spent 10-plus hours in a plane to experience the culinary bounty and natural wonder that you can drive to any time you want. I don't know about you, but that fact makes me feel a little guilty. 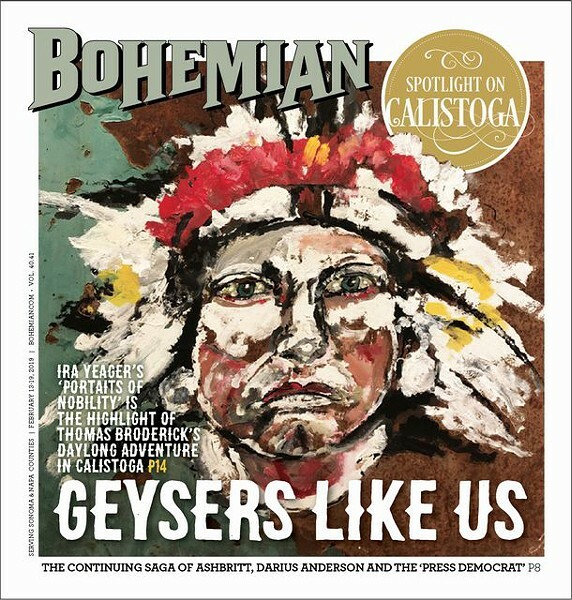 So when the editor asked me to write about how a local could have a memorable day in Calistoga for $100, I knew it would be a great way to reconnect with our shared corner of the world. However, there was a catch: I'd have to get up early. Yawning profusely, I set out before dawn with my trusty companion, Blue (my Honda Fit). Reaching Santa Rosa, I turned onto Highway 12 before making a left on Calistoga Road. Blue reported that it was 28 degrees outside. A new record. The commuter traffic dissipated after a few minutes, and I joined a short convoy of cars making the slow, windy journey up the ridge. Although the drive was a bit hair-raising for this local accustomed to valley floor cruising, the view became more beautiful with each passing second. When I reached the crest that exposed the Napa Valley below, I was rewarded with a moving sight: light fog drifting through redwood groves more than one thousand feet below me. No wonder so many artists call this place home. I parked on Lincoln Avenue just after 8, and it seemed that most of Calistoga was still asleep, and the only people on the street were locals getting coffee or walking their dogs. I was desperately in need of warmth, caffeine and calories. Cafe Sarafornia (1413 Lincoln Ave.) was one of the few open spots where I could take refuge from the biting cold. The only other diners were an out-of-town couple and a few retirees. Warmed up by the coffee, I examined the breakfast menu and ordered the "2-two-2" ($10.95): two pancakes, two strips of bacon and two scrambled eggs. The hearty meal arrived less than five minutes later. The two cakes were topped with tiny orange slices and a golf ball–size pat of butter. Even after buttering up my cakes, there was still enough butter left for at least three more breakfasts. I cleaned my plate—minus the remaining butter pat. Why can't I eat like this every day? It was a little warmer outside, and if I was going to have lunch in a few hours, I had to start burning off that fat breakfast. It was time for a long walk. Like many first-time visitors to Calistoga, I quickly noticed the natural geyser next to Indian Springs Calistoga (1712 Lincoln Ave.), one of the many famous resorts where weary travelers soak in mineral water and mud. I've never understood the mud soaks, but to each his own. Infiltrating the Indian Springs grounds, I avoided workers driving around on golf carts as I approached my goal: the geyser. But, alas, the geyser was behind the main office. I settled for traversing the stone maze on the property's edge. Passersby must think I'm nuts, I thought as I tiptoed between the rocks. Not much is open in Calistoga before 11 am, so I spent an hour at Bella Bakery (1353 Lincoln Ave). The food, especially the impeccably glazed doughnuts that would make Homer Simpson drool, made me regret eating such a big breakfast. I got a coffee and busted out my laptop to do some work. Around me, Calistoga locals came and went. It's a rule that when you go to a town with a touristy reputation, places the locals visit are the best places. Near the end of my time at Bella Bakery, a Hispanic man approached me. "Do you speak languages?" He asked. Having forgotten most of my high school French and college Japanese, I shook my head. "I speak five languages," he said before greeting me in Spanish and French. "Do you know who invented the color television?" Again, I shook my head. "He was a Mexican. Bless you and have a good day." He promptly turned and left the cafe. After a moment of stunned silence, I got on Wikipedia. When he was just 17, Guillermo González Camarena patented one of the first color TV transmission systems. And this was in 1934. How about that? 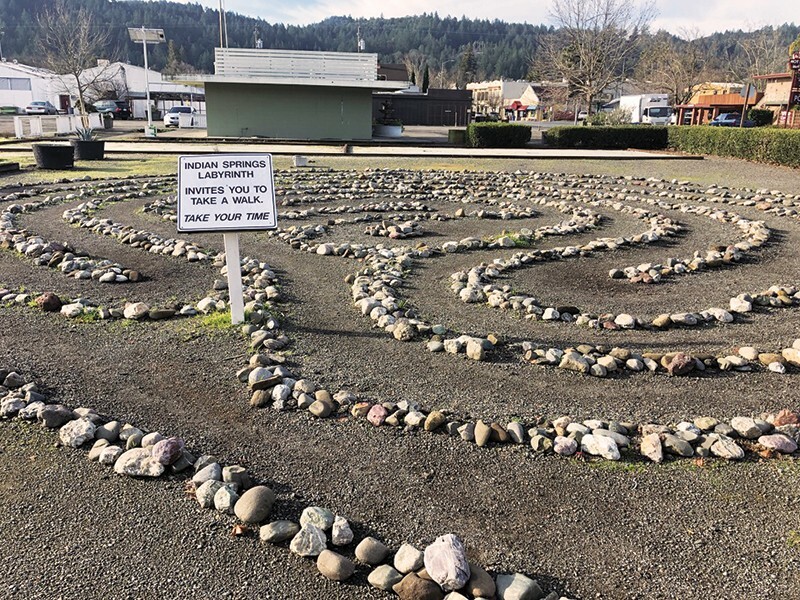 AMAZED Calistoga Springs invites you to slow the heck down on the property's meditative labyrinth. After briefly visiting the Yäger Galerie to set up an interview appointment for later in the day (see sidebar), it was time to start thinking about lunch. A weekday during the offseason is a strange, but amazing, time to have a meal in Calistoga. In other words, restaurants may feel deserted, but you receive special attention no matter where you eat. All Seasons (1400 Lincoln Ave.) has nearly a hundred seats, but only four were occupied as I stepped inside just after noon. Taking a small table near the window, I ordered a glass of 2016 Saddleback Cellars Vermentino ($12), a cup of butternut squash soup ($9) and ahi tuna carpaccio ($16). The wine was dry and light, and it reminded me of Granny Smith apple slices tossed in lemon juice. The soup was another delight, perfect for a Northern California winter day. The smooth, creamy soup was even adorned with fried squash blossoms. Alas, the carpaccio was a bit off. The flavors—lime, bitter greens, ponzu sauce, sesame seeds—were all perfect, but the razor-thin tuna slices were lost in the mix. You can't win 'em all, I jotted down in my notebook before ordering another glass of the excellent Vermentino. Just as ubiquitous as the spas in Calistoga are the antique stores. And as a history nerd, I wondered which one would have items that related to California and Calistoga history. Seeing the century-old wine presses in front of ROAM Antiques & Design (1124 Lincoln Ave.), I immediately knew that this store would be worth my time and then some. Stepping inside, Shayna walked up to greet me. Shayna was a small, old white dog bundled up in a doggie sweater. I couldn't help but scratch her behind the ears before introducing myself to her human, Barbra Hana-Austin. When she's not helping out ROAM's owner, Barbra keeps the past alive through her weekly podcast: Kosher Style Stories. In each episode, she weaves a yarn about her early life in New York City. As I had hoped, the store featured many relics from California's past, including various maps and a patinaed Hewlett-Packard test oscillator that was not just designed in Palo Alto, but actually built there in the 1950s. Tasting rooms are a dime a dozen in Calistoga, and for any new one to survive, it has to stand apart from the competition. No tasting room does this better than Tank Garage Winery (1020 Foothill Blvd. ), an establishment that for the last five years has served customers from a repurposed 1930s garage and gas station. This boutique winery solely produces one-off wines. In other words, buy a bottle today—because once it's gone, it's gone forever. What else sets Tank Garage apart—besides the prohibition-era décor, tasteful merch and fully-restored Indian motorcycle—is the employees' attitude towards the tasting experience. Heath Cooley, one of the most approachable hosts I have ever met, took me through Tank Garage's history while pouring me splashes of two smooth reds and two crisp whites, all blends of four to eight varietals. Tank Garage's two owners wanted to create an approachable and casual tasting room. I think they've succeeded tremendously. The tasting room's most interesting feature involves something visitors may not notice on their first or 10th visit: the floor. The concrete's reddish tinge owes its existence to heavy metals in the soil; six decades of auto work will do that. Heath recalled that the EPA made them tear up the foundation twice before they finally approved it. The way Health told it, it sounded like the feds just got tired of coming out there. But rest assured, dear readers: it's safe to visit. Thanks for comping the wine, Heath. Leaving Calistoga just after 5pm, I got caught up in the traffic. However, the slow ride up the mountain gave me time to reflect on the excellent food and wine, the people I had met and the natural beauty. And just like in the morning, when I reached the top of the ridge, I saw a beautiful valley below me. But this time it was the Valley of the Moon. It was good to be home.